On a cool starry night, what could be more magical than gathering around a warm, crackling fire, roasting marshmallows, drinking wine, and snuggling up with each other? A lit fire pit draws in people like fireflies and leads to a truly enjoyable experience. And to add to your convenience, there are so many DIY projects as well as readymade outdoor fire pit ideas to take inspiration from. 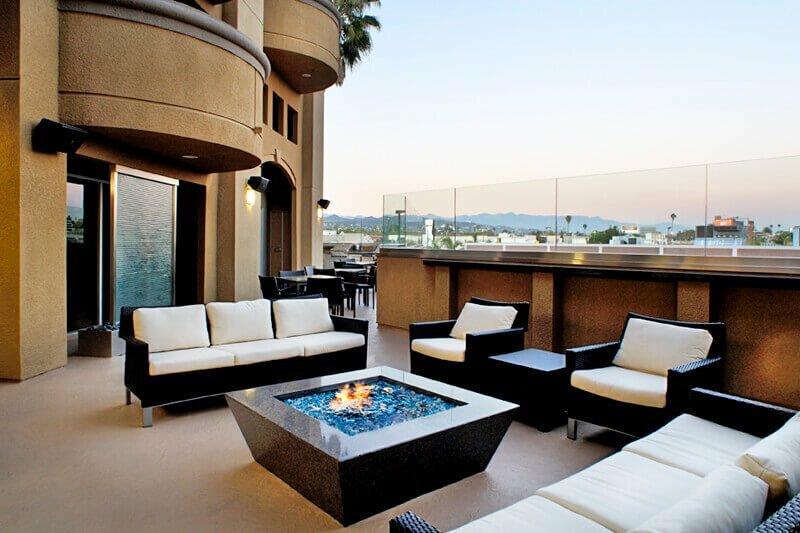 Be it a portable or permanent arrangement, an outdoor fireplace can act as the centerpiece in your patio or backyard. Come, go through these 13 ultra-cool fire pit designs and transform your exteriors into a cozy abode. Offering tremendous versatility and functionality, installing a fire table is one of the best outdoor fire pit ideas. They feature a table that comes with a center for lighting a small fire — either powered by gas or electricity. You can get warm around the fire while adding chairs to sit down for a cozy dinner. You even have space to place items on the surface. Depending on the space available and your needs, get an end table, coffee table, dining table, or bar table. A stone fire pit is really easy to make, goes will all kinds of outdoor layouts, and is extremely budget-friendly. Just get some stone bricks, lay them one above the other, and fix them up with strong glue or cement. Draw an outline of the area that you want to use for your pit and work along that. You can design it as a round, rectangular, or square fire pit — whatever suits you. This is one of the simplest DIY projects that you can take up and complete in only one day if you have all the required accessories. This is another variant of the stone fire pit – with a raised base. Its rustic design can complement any outdoor area such as your backyard or patio. With natural stone pools and elegant pavers, this gas-powered fire feature can be accessorized with contemporary outdoor furniture. This is a great idea for you if you have limited outdoor space. Fire columns are available in many stores and they are similar to a bowl, with the only difference being the shape. This is a type of gas fire pit — powered by propane or natural gas — that is in the shape of a long cylinder and has a space on top to light your fire. 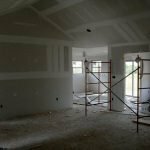 you can get columns made from wood or stone with a metal interior. 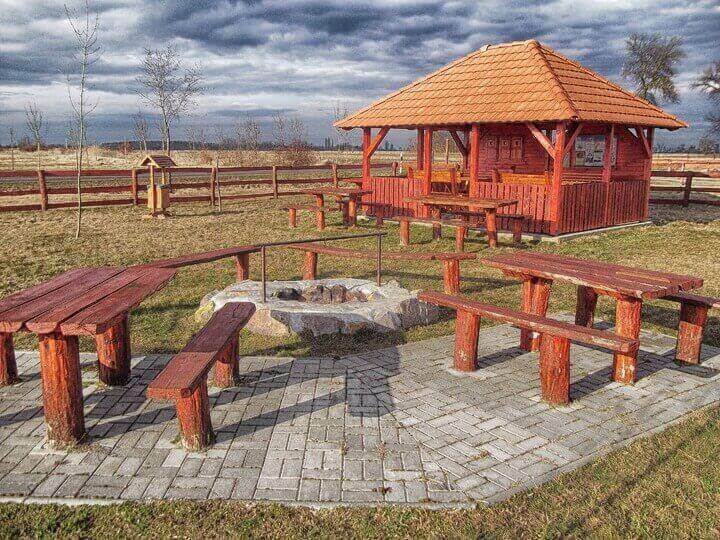 The entire structure lends a rustic, natural look to your backyard or patio. This is yet another one of the great outdoor fire pit ideas that use a basic rock layout design. You can purchase these rocks at a cheap price from any store or you can even pick them up from a lake or riverside. After that, simply lay them out in a circle, collect some dry wood, and light a fire. Place a few chairs over an extended gravel area and get cozy! Are you on a tight budget and still need a quick, DIY fire pit in your outdoor space? Then try this idea. Dig a hole (according to your size specifications) in your yard. Fill it up to a certain height with lava rocks. Now place bricks — in slightly tilted angles along the inner sides of the pit. Shovel away the soil from the rim towards the bottom on the outer side of the pit. 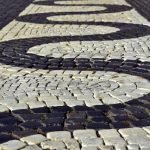 Now, place large flat rocks around the circle, above the bricks. Fill up any spaces and tighten them up with soil. There you go! A cozy and simple fire pit for your home. This is another one of our favorite outdoor fire pit ideas. Who doesn’t love the bowl shape in this portable fire pit? Your bowl can be of cement, concrete, stainless steel, or any other durable, fire-resistant material. Add some gravel in the middle for added safety. Then put in some dry logs and get started with roasting your s’mores! 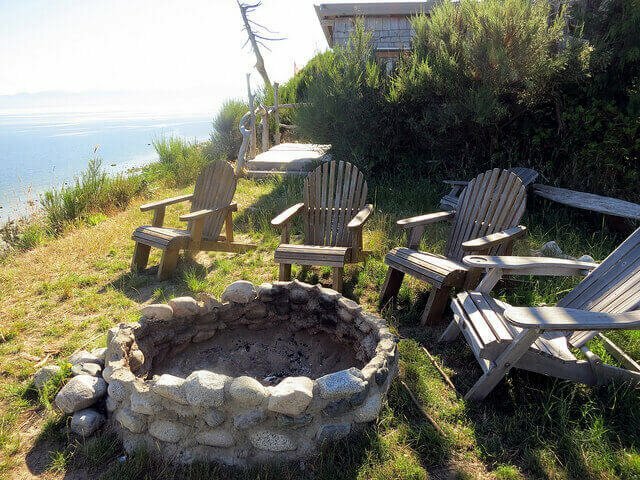 Concrete tree rings and metal fire rings make for a brilliant outdoor fire pit ideas. Get hold of two or more rings and place them above each other. For the inside, make another circle with smaller stacked rings. Fill up the space between the two with small pebbles to give your circular fire pit a grand look. This is one of the classic outdoor fire pit ideas. The basic concept is that you get an enclosure — made of fire-resistant material such as concrete or metal like cast iron or steel — where you can place dried wood. You then simply light it up and enjoy the warmth of a crackling fire. Enclosures for wood fire pits can come in several designs, styles, and sizes. Just get one according to your taste and use. 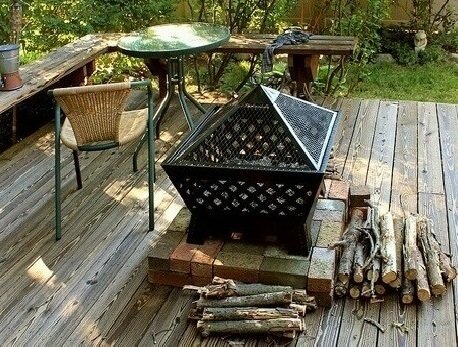 Did you know that you can use unused stuff from your living space and convert them into fire pits? Yes, you can. For example, take your discarded washing machine drum. Just take the help of a professional to introduce some tweaks and then use it for a portable, handy fire pit. Do you have the luxury of ample space in your patio? Maybe you want to convert it into a spacious sitting area. Then why don’t you consider the above idea? 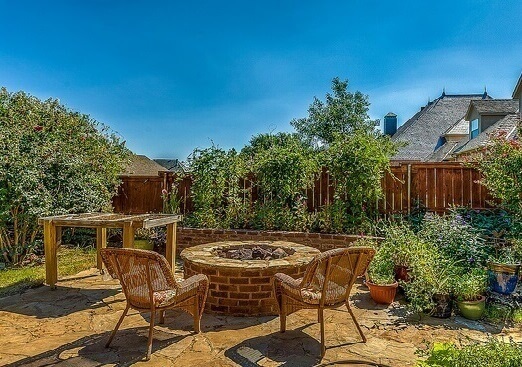 Just place some chairs around this open fire pit and convert it into a warm, cozy gathering space. The above fire pit idea is perfect for a contemporary home with a huge lawn or yard. Note the circular design, with concentric circles and the inner circle holding the space to light a fire. You can decorate this with some pebbles for added appeal. Place some matching chairs around it and you are all set! Well, this idea goes with any home with a modern layout. It’s ideal to be placed even on your balcony. Place an arranged seating area around it and you can use the entire space to host dinners, get-togethers, and also official parties. There’s no denying the fact that a fire feature or pit can create a beautiful ambiance and spread cheer like nothing else. With so many options in styles and functions, you can think of plenty of creative outdoor fire pit ideas — and these were just a few. So use your imagination and start making one on your own or simply get the set from a store. However, be sure to have all the required accessories in place — such as pokers, cooking grates, marshmallow skewers, wood handlers, tongs, a screen, pads, racks, and covers. For your safety, place a fireproof rug and fire-resistant furniture to utilize your outdoors to the maximum.